Lysichiton are hardy perennial bog plants that reach from 60 cm to 1.2 m in height. They have a very primitive look with yellow-green flowers atop of a spadix, which is surrounded by a white hooded spathe. One of the common names for the Lysichiton plant is Skunk Cabbage. Lysichiton americanus - Yellow Skunk Cabbage by Sandy__R. Common Names: Skunk Cabbage: Western; Yellow; Asian. Swamp Lantern. Height: 24 to 48 inches (60 to 120 cm). Native: Northern America. Northeast Asia. Growing Region: Zones 6 to 9. Flowers: Middle of spring through to the middle of summer. Skunk-like fragrance, with a bit of a garlic smell thrown in. Flower Details: Spikes. Yellow or green spardix. White or yellow spathe. Foliage: Ovate-oblong. Large; up to 50 x 32 inches (125 x 80 cm). Waxy. Deeply veined. Sow Outside: 1/4 inch (6 mm). Late summer; use fresh seed. Spacing 36 to 48 inches (90 to 120 cm). Sow Inside: Germination time: one to two months. Temperature: 55 to 65°F (13 to 18°C). Seeds should first be sown into flats. Stand flat in water. Three months in advance. Transplant outdoors following the last frost or in autumn. Requirements and care: Full sunlight (for best results) or partial shade. Wet soil; preferably in standing water. Deep soil. Fertile soil, Humus rich. Slightly acidic. Regular watering to maintain wet soil. 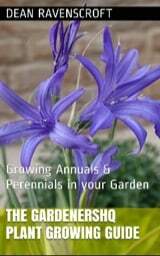 Protect seedlings from slugs. Propagate: by dividing in the spring or plant offsets. Miscellaneous: Fragrance is attractive to Beetles and flies. Lysichiton is also attractive to bears who eat their roots for its laxative properties following hibernation. 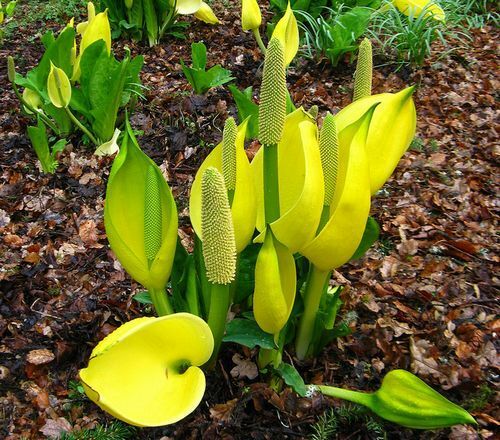 It is best to start growing Skunk cabbage outdoors. The seeds should be sown at a depth of 6 mm using fresh seed towards the end of summer. As they are bog plants, Lysichiton like to grow in a soil that is deep, rich and wet. Preferably Lysichiton plants hould be grown in a sunny boggy part of the garden. The germination of Skunk cabbage takes about one to two months. Once growing thin the seedlings so that they are about 90 to 120 cm apart. Skunk cabbage is pretty easy to grow and look after. It is important to keep the soil that Lysichito is in moist at all times, Ideally the plants will grow in standing water, but if this is not possible then apply lots of water to keep the soil saturated. If you require more Lysichiton plants then they can be had by division at the start of spring.